The other day, the bus we were on stopped at a place called Skoun for a quick bathroom break. The Cambodian man sitting across the aisle from us hopped off to grab himself a snack. He returned with a small bag filled with deep-fried tarantulas, which he proceeded to pop into his mouth greedily for the next few minutes. Eyeing one of the hairy little bastards as he sunk his teeth into it, I could only comment to Jessica that the ones we'd eaten were a lot bigger. Tastier-looking, too. As I understand it, it began during the years of Khmer Rouge rule, when most of the nation was engulfed in famine. Much of the rice being grown was shipped to China, in return for guns, and those starving in the fields turned wherever they could to find food. In Skoun they found it scuttling about up in the hills: tarantulas. Apparently, they developed a taste for them. Eight-legged furballs are on the menu in Skoun for every meal. At the little bus stop we pulled into for ten minutes, women had them piled high on platters, hundreds of them, deep-fried and ready for eating. We'd read about "Spiderville," as it is affectionately known, and had long joked about eating a tarantula there (if only for the photo opportunity). I never especially thought we'd actually do it, though. And anyway, if you're going to consume an arachnid, you're going to want to linger over it, aren't you? I mean, really take the time to appreciate every furry little limb, right? Well, we discovered, there's a better way to go about it than shoveling one into your mouth at a dustly little roadside rest stop. It's in Phnom Penh, and it's called Romdeng. Romdeng is a wonderful little place, part of the Friends organization. Former street kids enrolled in the program first train in-house, cooking for and waiting on each other and the hundreds of kids living in the Friends Residence House. From there, "graduates" move on to work at Romdeng where they interact with the general public for the first time. Eventually, they work their way up to the final level of hospitality training, the famous Friends Restaurant itself. This means that one important way that Romdeng is different from the Friends Restaurant is that the students working there are much "greener", less practiced, and much more timid. When we first went there, a "teacher" had to take our painfully shy waiter by the arm and lead him over to take our order. If there's a more adorable and inspiring place in the world than Friends, it's Romdeng. A second way that the two restaurants differ, and one more central to this story, is the cuisine in which they specialize. Friends serves Western and Asian cooking, whereas Romdeng specializes in native Khmer culture and food. Like tarantulas. We couldn't resist. 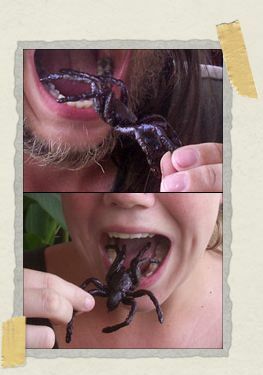 Here was an opportunity to eat spiders in Cambodia, just like we'd always joked about doing. And we could do it in a relaxed (and clean) restuarant setting, instead of at some squalid little rest stop. And we'd be supporting one of Cambodia's most worthy charities at the same time. There were butterflies in my stomach when we ordered. Maybe the tarantula would devour them. Frankly, we had expected to get one tarantula. We'd planned to take turns getting photos taken holding it up, and then each nibble on a leg or something. What we didn't expect was to get three of them. In a fit of madness, I'd volunteered to go first. I blame a complex cocktail of machismo and chivalry. Whatever the reasons, though, I didn't want to wuss out now that the time had come. I picked up one of the enormous, hairy, eight-legged beasts and dipped him into the accompanying pepper sauce. (I bet they don't serve that at the Skoun rest stop!) Not pausing long enough to let my mind catch up with what was happening, I bit the two front legs in half. You know, I really have to hand it to the staff at Romdeng. Marinated in lime and dipped in pepper sauce, the things were actually pretty damn good. After I'd taken my first few bites, it was Jessica's turn. For someone who was a touch squeamish about spiders at the beginning of our trip, she didn't hesitate in the slightest, digging into her tarantula immediately. We each consumed one of the tarantulas in its entirety. Except for the mandibles, that is (those little leg-like claws around the mouth). Our waiter had told us that you don't eat those. We then split the last one between us, but didn't bother with its abdomen (the back half of the body). As we'd heard it would be, the abdomen was not appetizing in the least, and neither of us felt the need to have a second one. For those who are wondering, they do indeed taste a little like chicken (and lime and pepper of course, but that was more Romdeng's doing than mother nature's). As for the texture, that varied from body part to body part. The legs generally had a pretzel-like feel to them, whereas the head was a bit more like a wad of potato chips. That nasty abdomen, meanwhile, felt like nothing so much as an olive. Anyway, if you find yourself in Cambodia, and you want to try something a little different and maybe a little bizarre, then go to Romdeng and order up a plate of tarantulas. And skip the abdomen. Really. In the meantime, I saw a street vendor yesterday selling deep-fried cockroaches. Hmm. Maybe on the next trip. I've eaten some insects in my time, but, I don't know, I think I'd have to be suffering from famine to overcome this mental barrier. However unnecessary, just the thought makes me shiver. EWWW! Just, "yuck"! I read that with my hand unconsciously over my mouth. Jessica looks a bit nervous in her pic, with the 'spread' before her. Better you than me… I bet the grandkids won't believe THAT! Brave, brave souls, the two of you. i love the "censored" pictures. 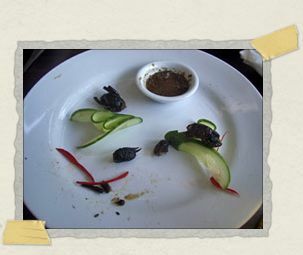 and am amused at the concept of having garnish on the plate with the spiders. No words can describe my… my…Oh gosh that's just creepy! Better you two have that little taste treat than me. Fear is not a Factor for Jessica and Tim. I can understand how it might feel mean given you have pet tarantulas (much like I could never eat a dog or a cat)…but it's not something that is done with ill-intent. 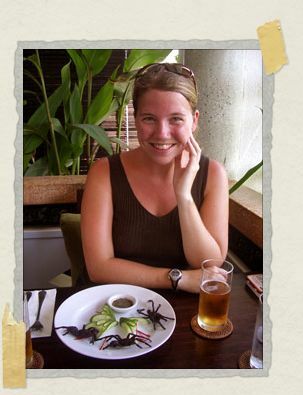 Tarantulas are just another type of food in Cambodia.